The Deputy chief executive officer of International Affairs of Rostec Dmitry Shugaev in the framework of the First International Forum of Eurasian Partnership from the name of his company thanked Ara Abrahamyan for the invitation and the opportunity to have a speech. He has presented his company, highlighting that it is the basis of Russia’s industrial sector. -Our company includes more than 700 organizations, with more than a million employees, – he stated. He mentioned that they have representatives in 50 countries, including Armenia. – Our cooperation with Armenia is on a high level. Two years ago, one of our companies “Galaxy” air traffic control system was established here. A year ago we won the tender to supply automated workstation systems to the Gyumri airport. Our famous “Kamaz” company has a strong sales and service center here that is successfully developing. There is even an “exotic” example of cooperation in the field of sports: the hunting Centre “Kalashnikov”, which is representing the kit produced by “Kalashnikov” concern. Armenian men are serious and respectable, if they are interested in such products,- he said. 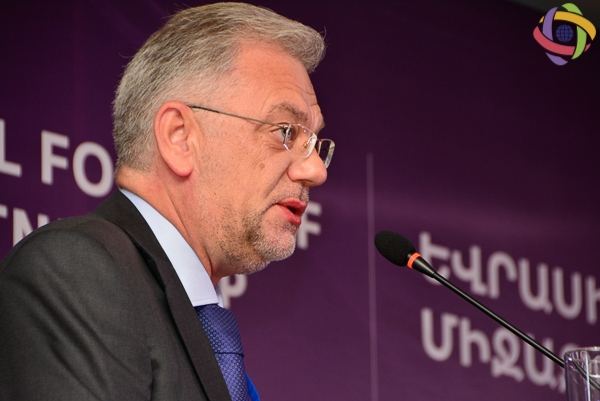 Dmitry Shugaev highlighted that they are open for cooperation with the representatives of Armenia. Moreover, he believes that this platform will become an occasion for wider cooperation.